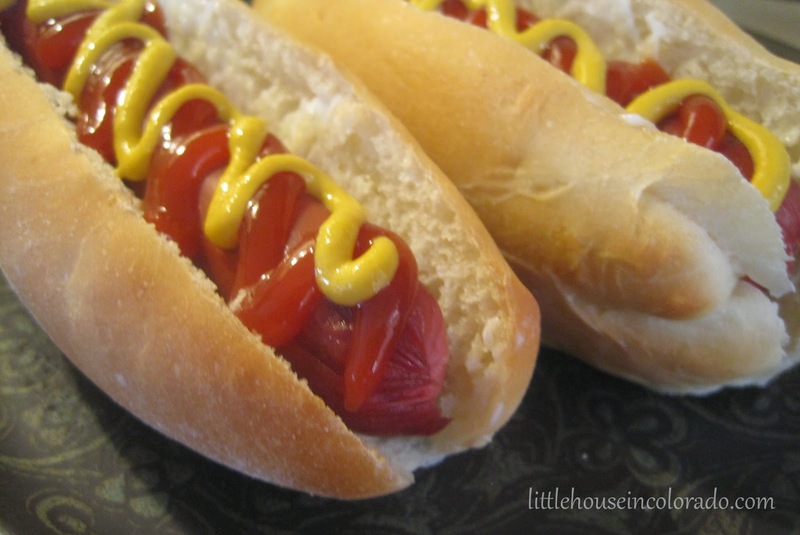 These homemade hot dog buns are made using the versatile Potato Refrigerator Dough I have been experimenting with. 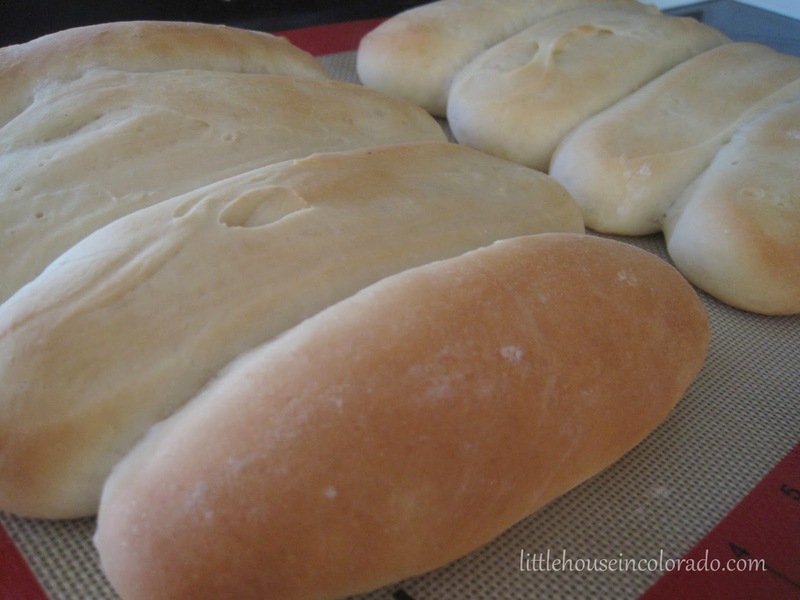 I discovered I had forgotten to buy hot dog buns earlier in the week and rather than making another trip to the grocery store, I attempted made-from-scratch hot dog buns using some of the already prepared refrigerator dough. 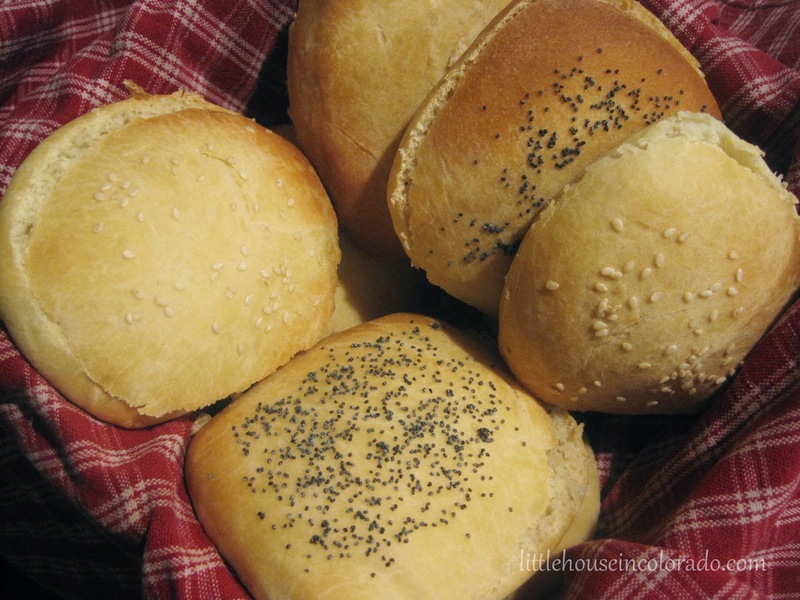 The first batch I made followed some hamburger bun directions I had found online. 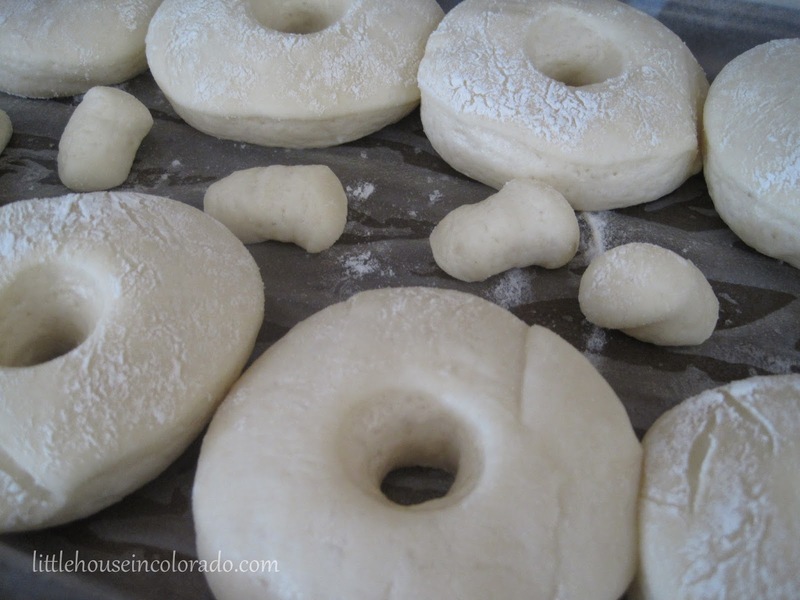 I figured I could just change the shape of the dough before baking. It didn't work out that way. The recipe made too many buns (12) resulting in too small hot dog buns (or very elongated dinner rolls). 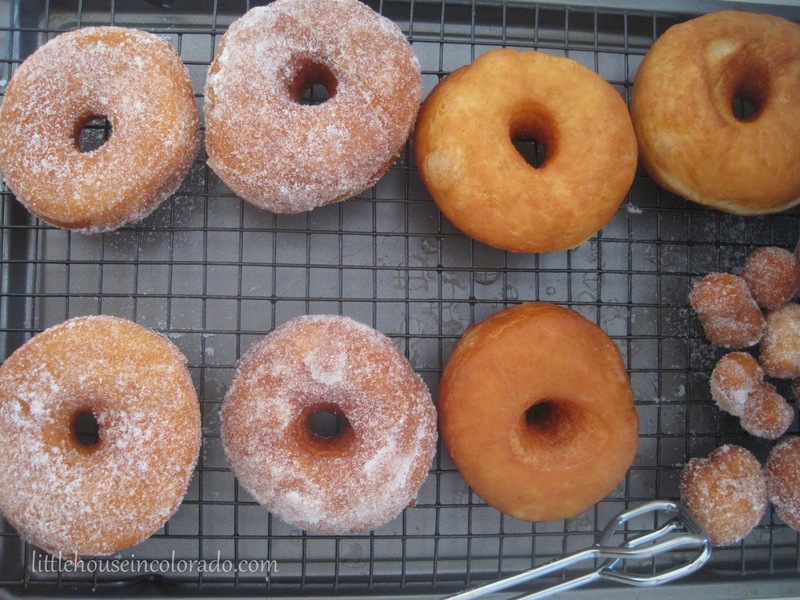 The oven temperature was also much too hot and the buns were over-baked before they every reached the lower end of the cooking time range given. The following day, I began again. 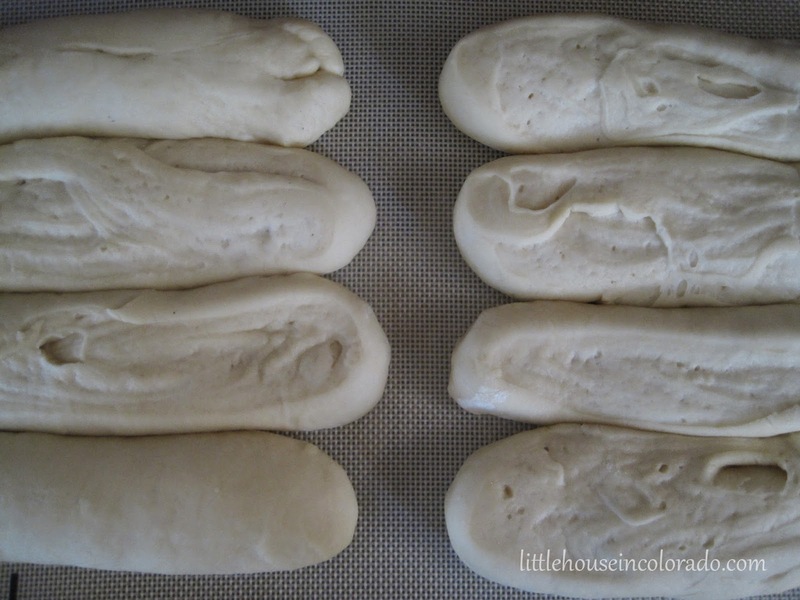 I decided to bake the dough at a much lower temperature and only make 8 hot dog buns. 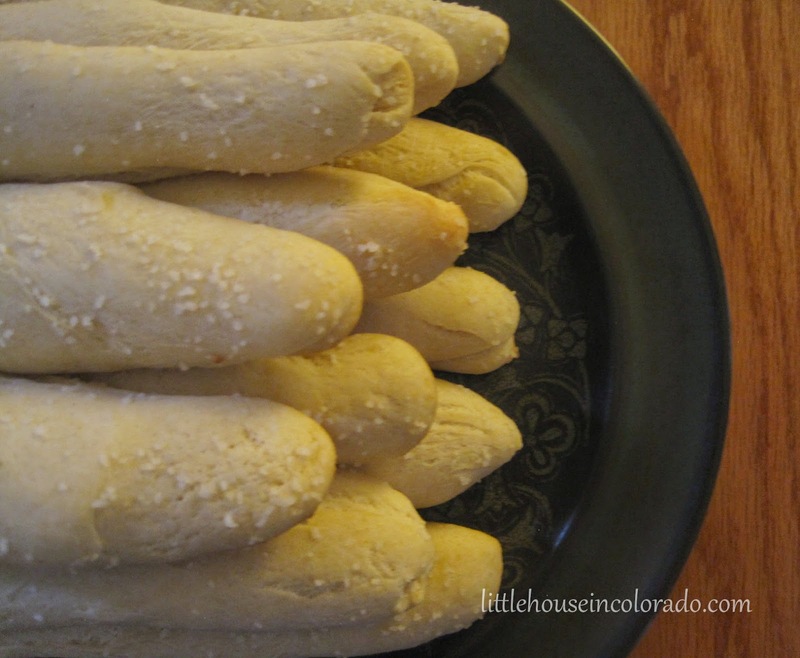 We used them for "bun length" hot dogs but they are plenty big enough to handle brats or smokes sausages. 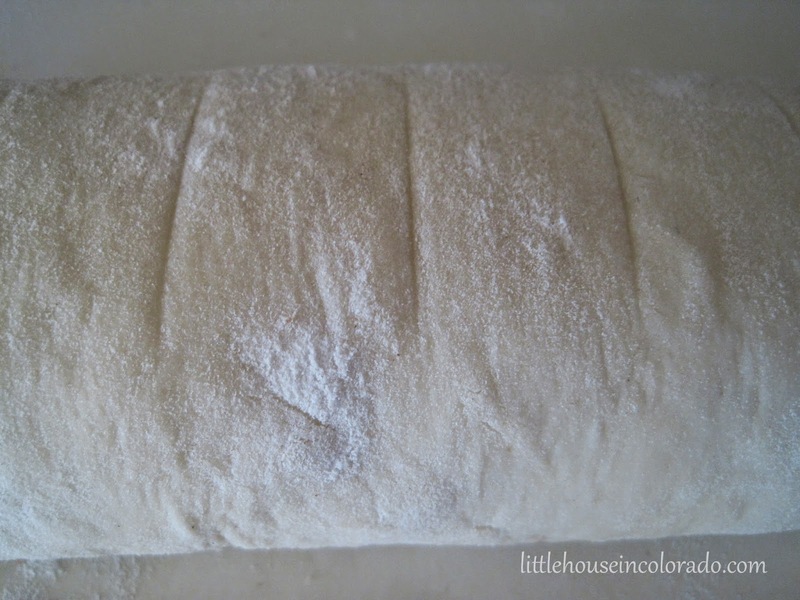 Shape each part into a rope approximately 6" long on lightly floured surface. 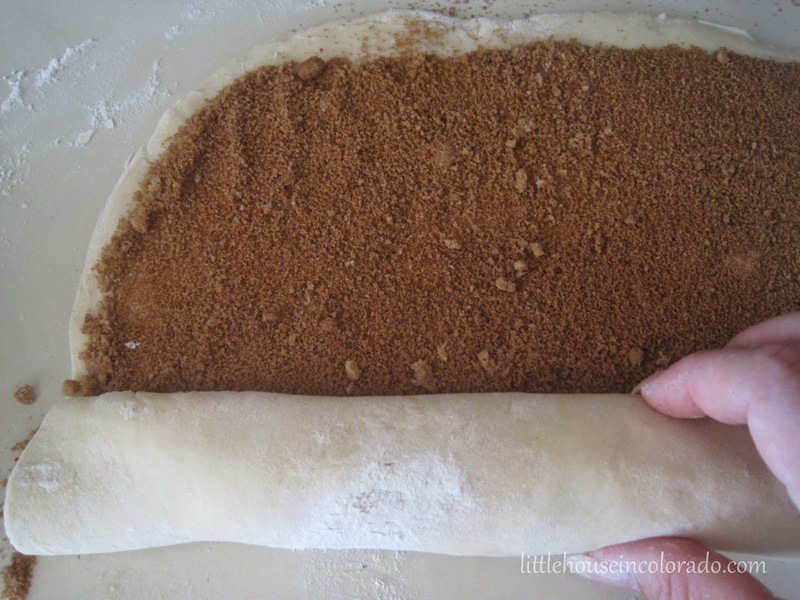 Place about one half inch apart on greased baking sheet (or use a silicone mat on the baking sheet). 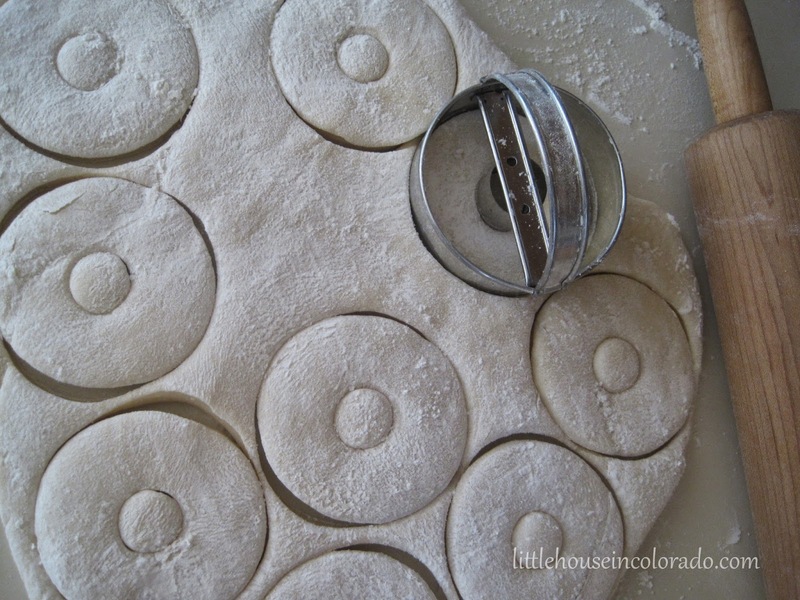 You want them to just touch each other on the sides when they rise. 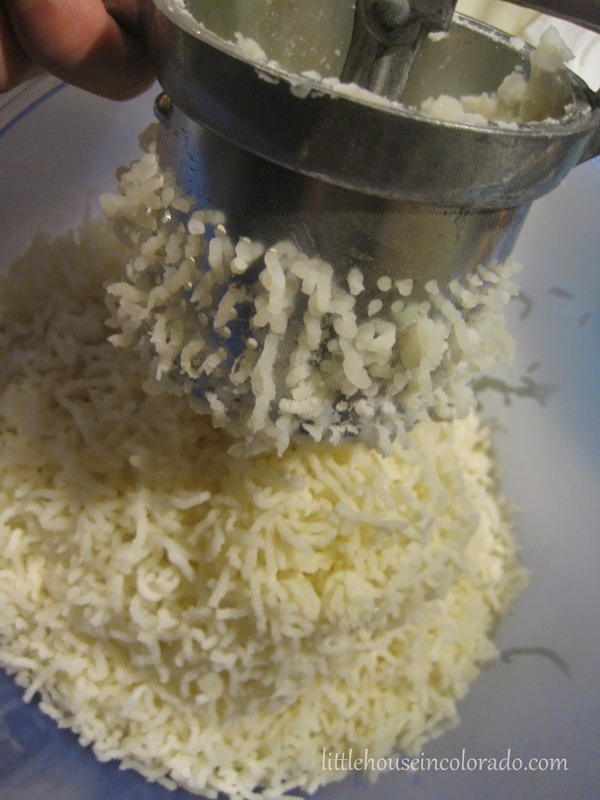 Bake until golden brown, 18 to 20 minutes. 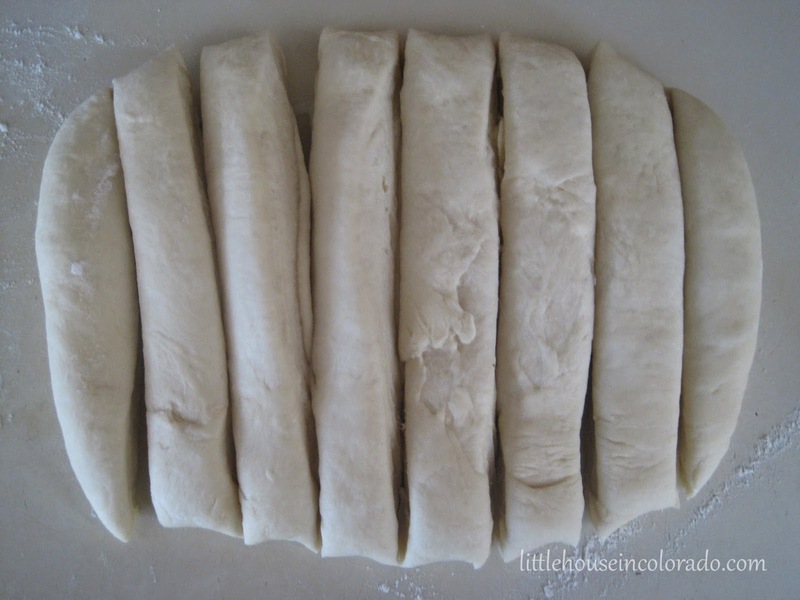 Split each bun lengthwise. 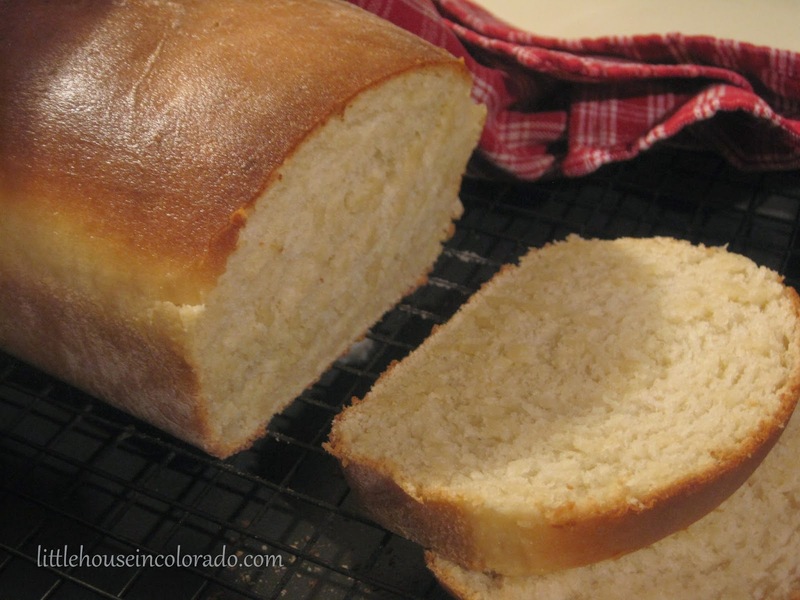 Makes 8 large hot dog buns 6 to 7" long. 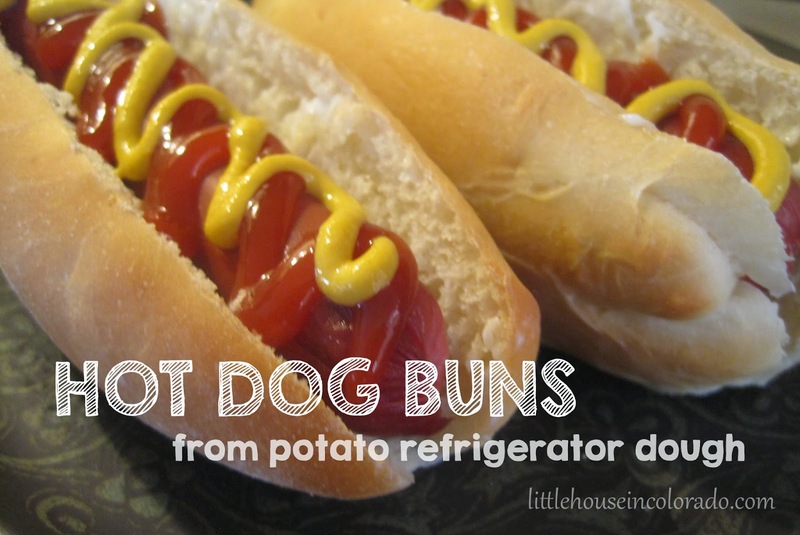 Perfect for bun length dogs, brats and smoked sausages. We have lived in Colorado for four years and had not yet taken the "Pickles" to a single county fair. It was time. 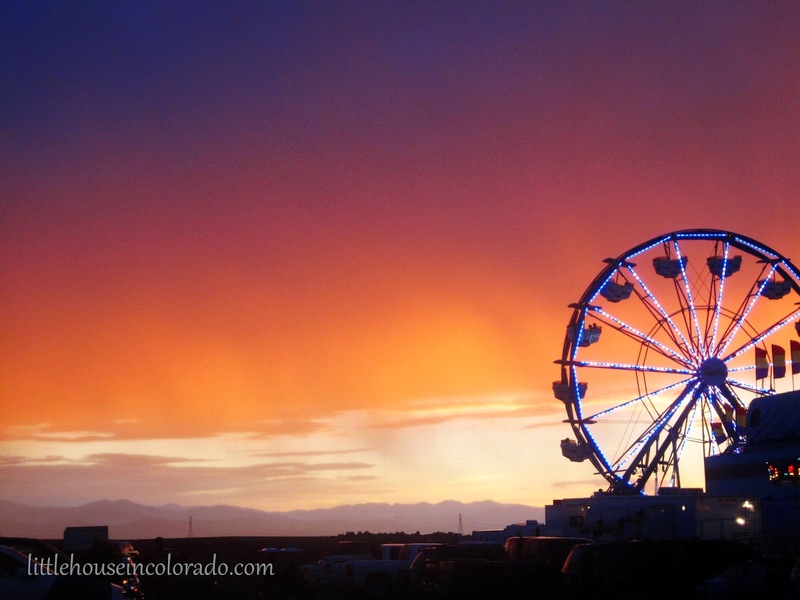 There are many county fairs all within a short driving distance from our house in Aurora. We live in Arapahoe County so that's the fair we chose to attend this year. The view from the ferris wheel. There's not much beyond the fairgrounds except wide open spaces. 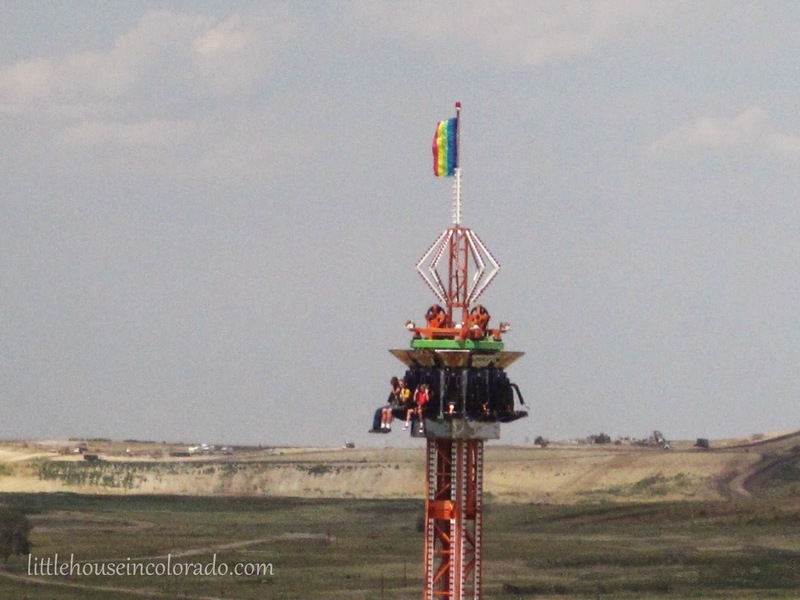 The Arapahoe County Fair had an "all-inclusive" price...one price included admission and unlimited rides. $10 (plus a $2.25 per ticket "convenience fee") if you purchased pre-order tickets online, or $15 at the gate (the pre-order tickets could be used for any ONE of the 4 days of the fair's duration). While this isn't a good deal for those who don't ride much (or can't ride at all), the "Pickles' were able to ride their favorites over and over (and over) again. 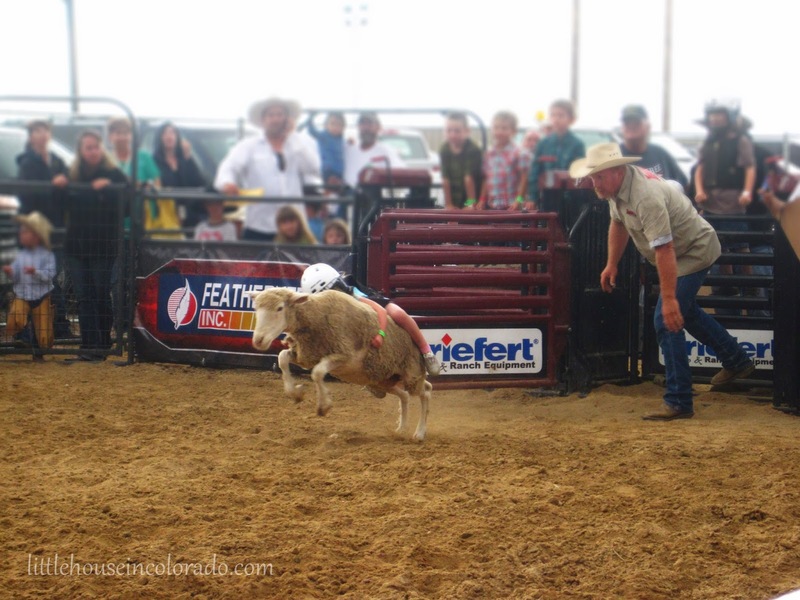 The price also included admission to things like the 4-H shows, rodeos, tractor pulls, mutton bustin' (for the kids under 50 pounds), demolition derby and all concerts. A thunderstorm moved overhead in the middle of the day so we all shuffled inside to view the 4-H exhibits. 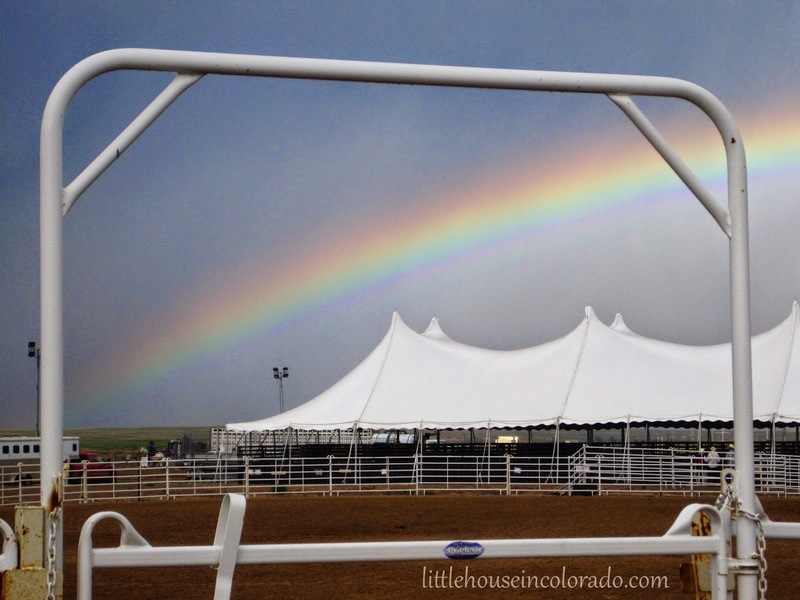 Once it had passed, we stepped outside and saw a brilliant rainbow over the arena! Food is always a budget-buster at a fair so we had planned ahead and packed some snacks and bottled water. We had agreed that we would buy some "token fair food" because one of the best experiences about a county fair is the food, but we would keep the purchases to a minimum. We got sticker shock when The Boy announced he wanted a turkey leg and we saw they were all $10 each. Needless to say, he didn't get a turkey leg. 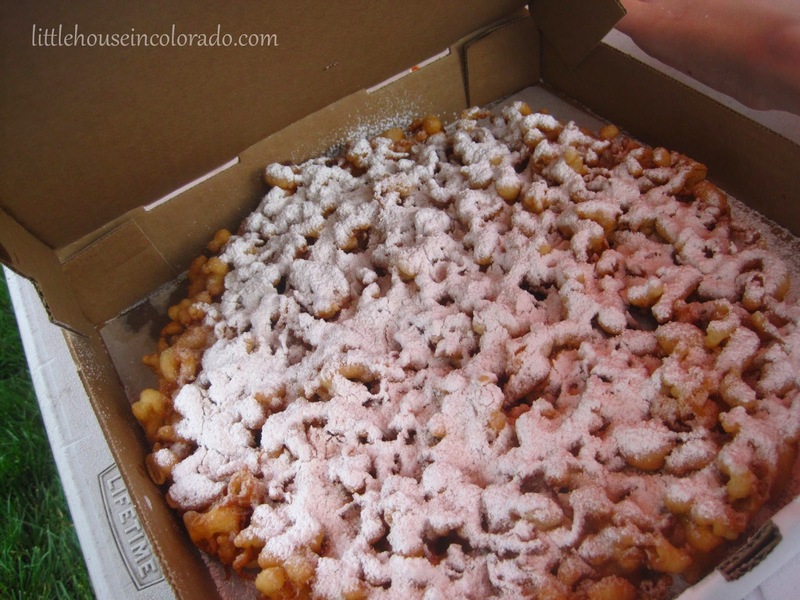 We each got a (small) corn dog and split a "family-sized" funnel cake. It was about the size of a medium-sized pizza! I wanted to stay long enough to catch at least a portion of the Rodeo. 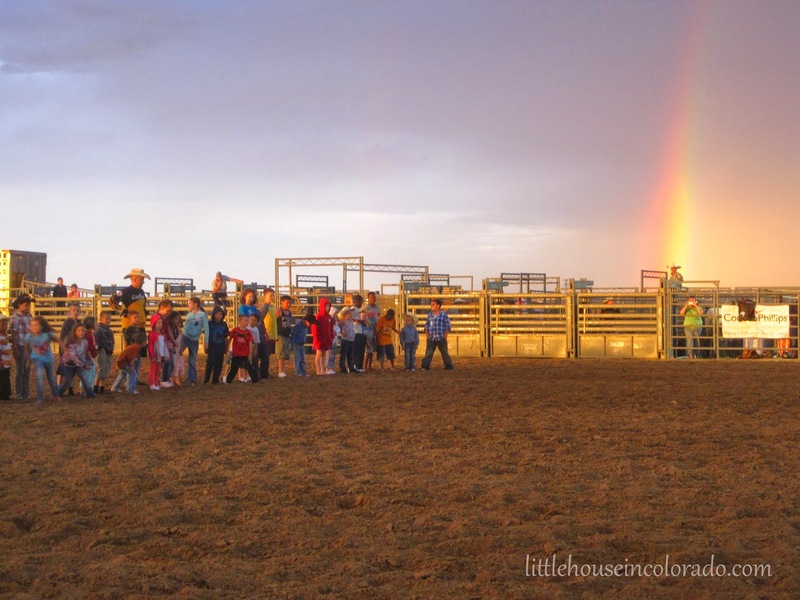 A couple of other drizzly showers passed over us but The Girl got a thrill from seeing all the horses, she was able to participate in the "Boot Scramble", and a new rainbow formed behind the rodeo arena. Getting ready for the "boot scramble"
Coming from North Carolina, we were used to the large Dixie Classic Fair (the second largest agricultural fair in North Carolina) that would run for 10 days and had a huge Midway, multiple entertainment stages, tons of agricultural contests and exhibits, loads of food vendors and hundreds of local businesses touting their products and services. It took several visits to see everything that fair had to offer. 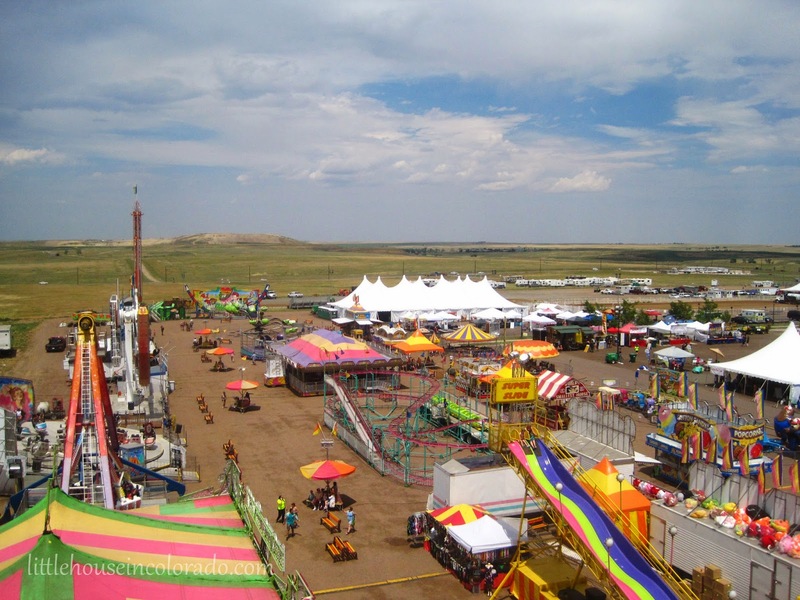 The Arapahoe County Fair is tiny in comparison but comparing the two fairs really wouldn't be, um, fair. I do have to say it was nice to wander around without worrying about crowds. It was faster to get food. The wait for rides was very short. And while I missed the wide range (and massive quantity) of exhibits the Dixie Classic Fair has to offer, it was nice to be able to take our time looking at all the crafts and foods and produce on display at the Arapahoe County Fair without worrying that we were going to run out of time and "miss something". We were at the fair for about 8 hours and saw a good portion of everything available to see and do. 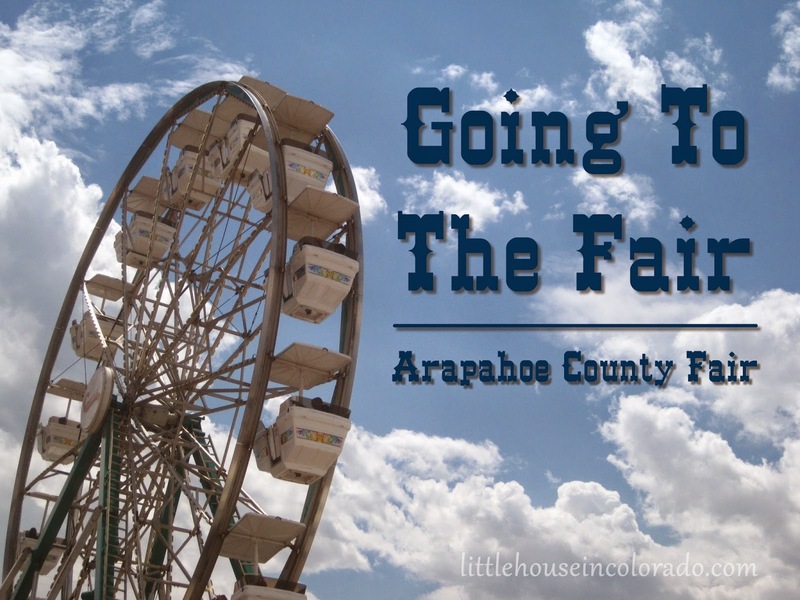 For more information about the Arapahoe County Fair, visit their website at ArapahoeCountyFair.com. "What I want in my future is bigger than what I want in my present." Dave Ramsey's debt snowball plan is structured in such a way that it helps you stay motivated and sets you up for success when it comes to those bigger debts. In the debt snowball, you pay those smaller debts first (regardless of their interest rate) because paying one debt motivates you to continue. You move on to pay the next one and the next one and so on. Those smaller wins really help to keep you going. They also help to recondition your brain. You learn how it feels to win with money, to change your behaviors about money and to start making more money wise decisions. Lastly, once you reach the larger debts, you have a really big "snowball" to throw at them. But even with a big snowball, lots of smaller "wins" under our belts and 2 years of much more careful, wiser money decision experience, we needed to find ways to keep the momentum going. After 2 years of working our debt snowball, I can honestly say there have been many times I've thought about going back to the way things were. It was easier back then, ignoring the debt. But working our debt snowball made it difficult to turn away from all the progress we had made. And we HAD made plenty of progress. By the time we hit our 2 year mark of working through the debt snowball, we only had 2 remaining debts. Two very large student loans. Very, very large student loans. We were looking at a solid year of throwing every spare penny at those loans to make them go away. And here we are now, several months into paying on those student loans with several months still left to pay on those same student loans. It's like being in a rowboat in the middle of an ocean. 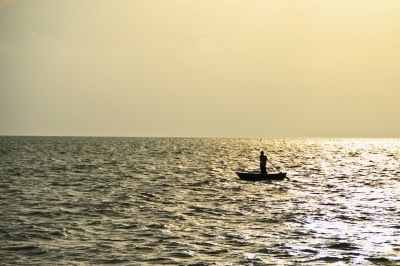 You paddle and paddle and paddle, day after day after day and all you ever see in all directions is ocean and sky. It's easy to lose momentum. It's hard to imagine seeing land when all you keep seeing is ocean. Sometimes it's hard to see debt freedom when all you can see is a big pile of debt. When you throw several hundred dollars a month at a debt that is a couple thousand dollars, the amount left on your debt decreases quickly. It doesn't take long before that debt is gone! That creates more motivation to continue. But when you throw several hundred dollars a month at a much larger number, let's say $20,000, you still have a REALLY big number left over. Several hundred dollars doesn't make a very big dent in $20,000. It takes a whole lot longer to eliminate that large debt. So when progress seems slow, how do you keep the motivation alive? How do you make sure you have enough momentum to propel you forward through the largest debts in your debt snowball? I've put together a list of some things that have worked for me. If you are working your debt snowball the way Dave Ramsey teaches, your largest debts will be the last ones. I love the way that works out. By the time we got to our huge student loans, everything else was paid off. That meant we had a large chunk of cash every single month to throw at the student loans. Once the first (smaller) student loan is paid off, there will only be one left. The final debt. The LAST debt. That in itself is a big motivator. Remind yourself how close you are to the finish line. When you have finished paying your last debt, it will be all over. You will be DEBT FREE! Many people feel it's easier to accomplish a goal when you have someone doing it with you. Whether it's a gym buddy or a study partner, having someone working with us towards a common goal seems to help keep us motivated. So why not do that with your debt elimination plan? Let everyone know what you are doing. I don't mean you have to discuss your budget with your garbage man or the babysitter, but certainly you can share your goals with friends and family. They can support you in your efforts. They'll also know to cut back on the number of times they ask you to spend money ("join us for dinner out" or "let's grab a couple drinks" or "that dress is definitely you...you should get it!"). We discussed the debt elimination plan with the Pickles as soon as we started it. We wanted them to know we wouldn't be going to restaurants much anymore. We wouldn't be buying a lot of "stuff". We were going to be very careful with our money and how we spend it. We also told them WHY we were doing it. We wanted to move out of this rental and get a place of our own. Each of us in this family has their own reasons for wanting a house of our own but it is a common desire with all of us. 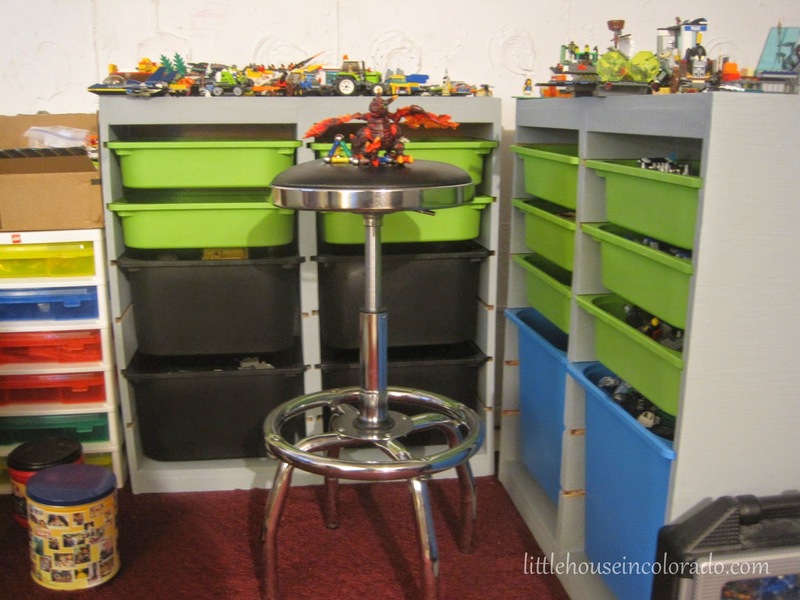 The Boy even offered up his entire savings in order to help us get out of debt so we could buy a house sooner. We were grateful, but declined. When I was trying to quit smoking, I put up a post-it note and made a mark on it for every time I went outside for a cigarette. It was posted where everyone could see it. Even my children, my most vocal cheerleaders, were able to keep up with my progress from that simple post-it note. It held me accountable for my actions. The same sort of "public" accountability can help you with your debt snowball. 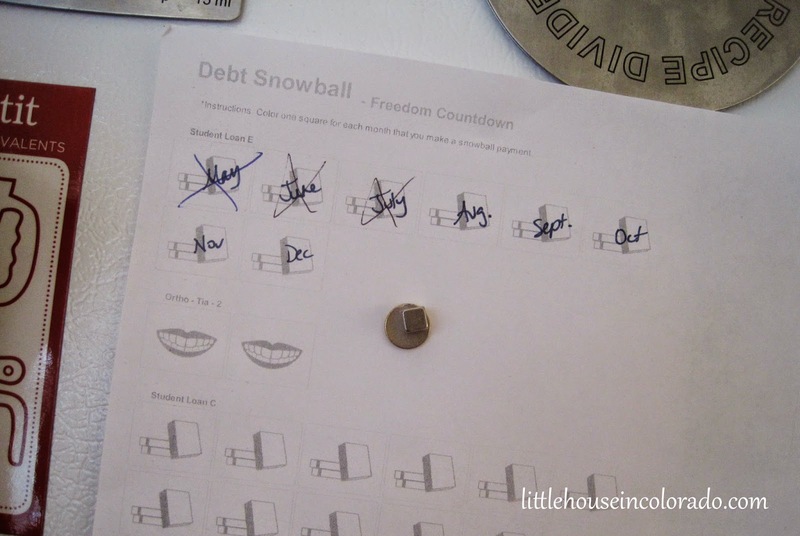 We keep a debt snowball chart on the refrigerator that shows all the months we will be working on a particular debt. Every month we make our normal payment and then cross off that month. Then if we are able to put additional money toward the debt that month, we would. Sometimes, we were able to send in enough additional money during the month to be able to eliminate an additional month from the chart. It was simply a piece of paper but it felt like our financial billboard. Everyone in the family could look at that chart and say "Wow! We've paid off a lot so far!" or "Wow! We only have 10 months left to go!" When Mr. LH and I first started our debt snowball, I asked him what debt he wanted to pay off more than any other. For him, it was the student loans. For me, it was a Discover credit card. I couldn't wait to get that thing paid off and shredded. If I came across something I thought I wanted to buy, I would compare it to getting that Discover card paid off. The credit card would usually win. Once we got to that card in our debt snowball, we hit it with everything we had and paid it off in under 4 months. Once it was paid off, I needed another stepping stone...another goal...something else to help me move forward. My next stepping stone became Mr. LH's student loans. I wanted so much to see the relief in his face when those were paid off. Every month brought us closer to that date and anything I could do to save money in other areas of the budget brought the date closer to us. From the beginning, I have recorded the balances of every debt every month. I also calculated the total debt and the difference from the previous month (showing the total amount paid). Each page shows 6 months of debt balances. The latter pages show mostly zeros. It really helps me to be able to look back and see how far we'd come in only 2 short years. Whenever Mr. LH seems particularly stressed about getting something paid, I pull out those sheets and show him all the progress we have made. It makes him feel a whole lot better knowing that all his sacrifices and hard work are paying off. Our bare bones lifestyle has remained the same (or gotten even more bare bones) for two solid years but "behind the scenes", our debt has been going away. Mr. LH and I had always talked about moving west. We had always looked toward the mountains searching for that perfect private out-of-the-way plot of land with a view. We've always had it in the backs of our minds practically since the day we met. See this spot of land? 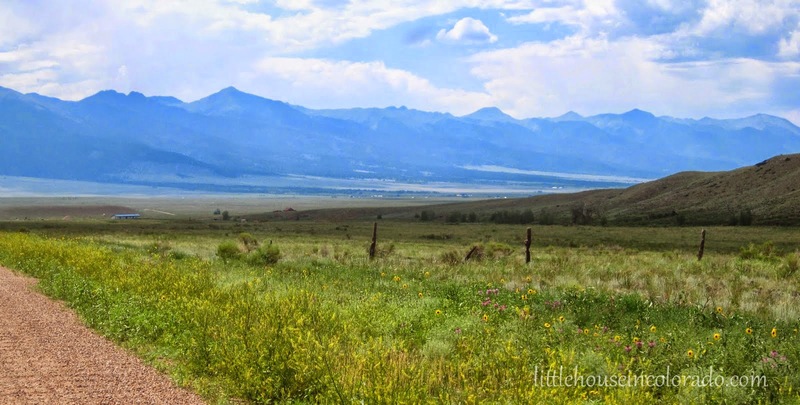 It's one of many spots of land I find extremely desirable in the middle of nowhere, Colorado. This particular spot is my favorite - somewhere along a dirt road 17 miles from the nearest town...a little town. It's not for sale right now, but there are similar plots nearby. I can picture a small house, a barn, a chicken coop and a large garden on this spot of land. I can see in my mind the glorious orange sunsets over those mountains and years of happy, peaceful living with Mr. LH. I want it and I want it now. But it's hard to get a loan for unimproved land. You need cash. A lot of cash. And before we can start saving money for our land, we need to pay off our debts, build an emergency fund, and set up a system for putting away money for retirement and college. While we are many steps away from it, this land is the backdrop of the "big picture". I look at this image a lot. It is burned onto my brain. I plan out where everything will go...house, outbuildings, garden beds, trees. I learn everything there is to learn about the native flora and fauna, county ordinances, water laws and the weather patterns there for the last 20 years. This dream (this obsession) is so much a part of me that it motivates me to keep going. If we don't pay off our debts, we can't live on this land. If we don't build up our emergency fund, we can't live on this land. If we don't have retirement and college funded, we can't live on this land. If we don't save enough cash, we can't live on this land. Know your "big picture" and it will become a great motivator. Getting out of debt takes dedication, work and patience. For some people, it happens slowly. For others, it happens more quickly. But it does happen. When you see it happen, when you see your debt going away, it motivates you to keep going. We've been paying off debt for over two years. Right now that seems like a long time (and we're not done yet) but in the grand scheme of things, a couple years is a very small price to pay for being debt free. I had a pile of T-shirt yarn balls from a bunch of T-shirts I had cut up months before. They were just sitting in my yarn basket untouched and taking up space. 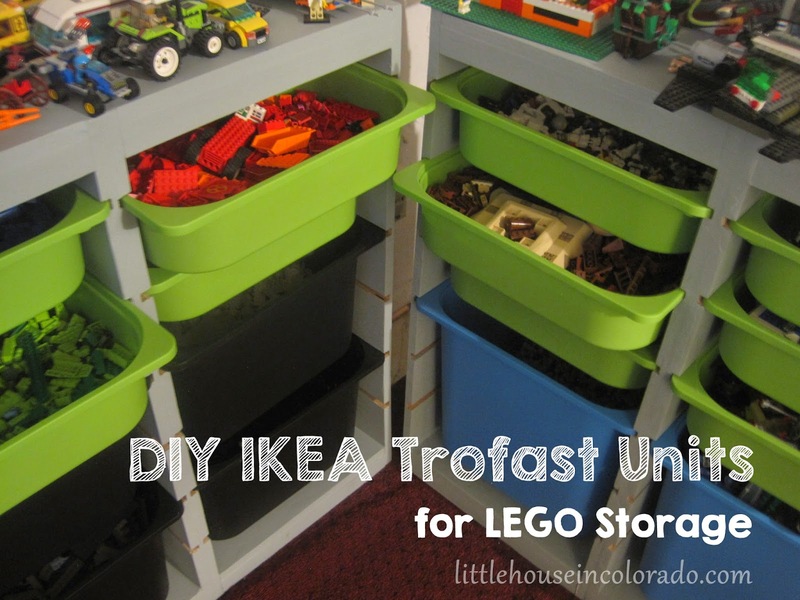 But I now had so many storage baskets I was giving them away. 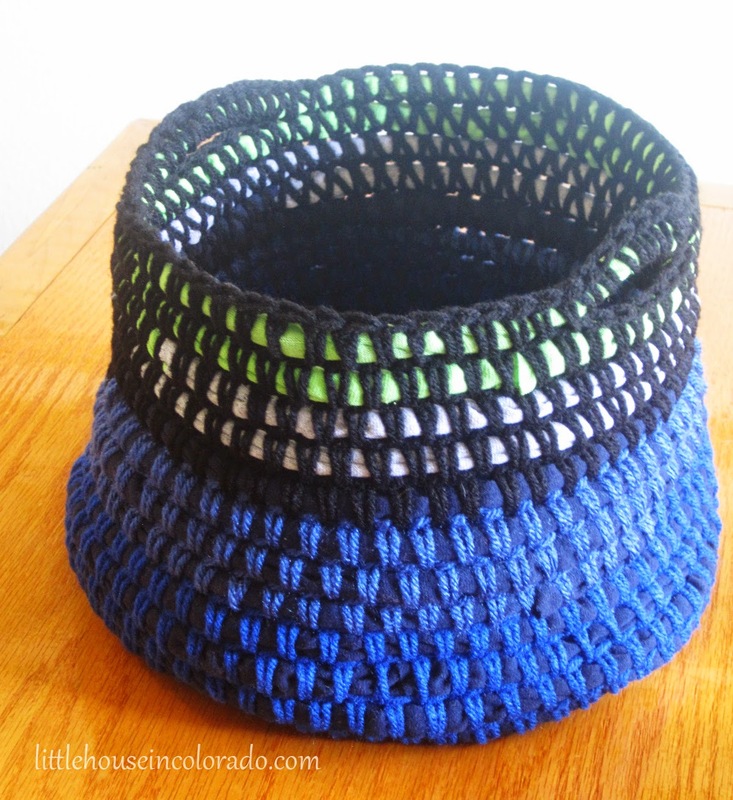 I decided to take all that t-shirt yarn and use it up. 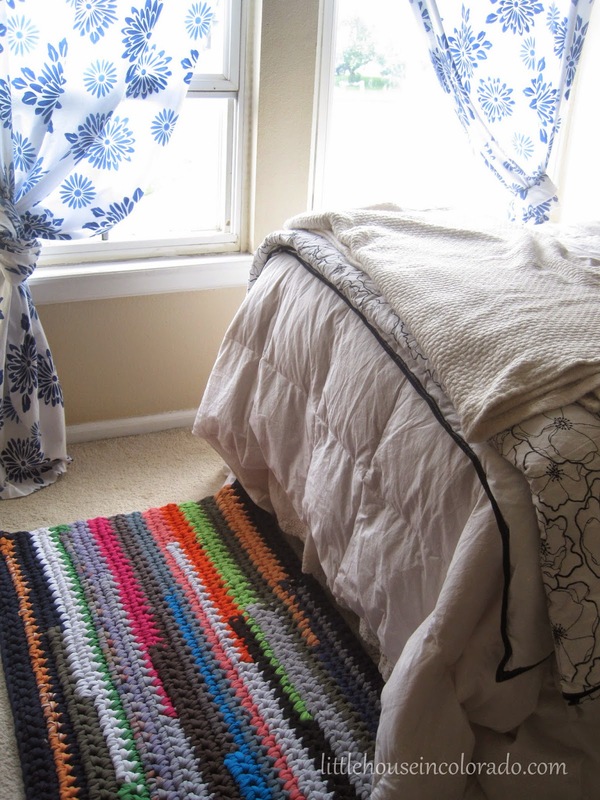 I used my Boye size S 19mm crochet hook and made quick work of that pile of yarn...by turning it into a rug. It is certainly a mess of colors! 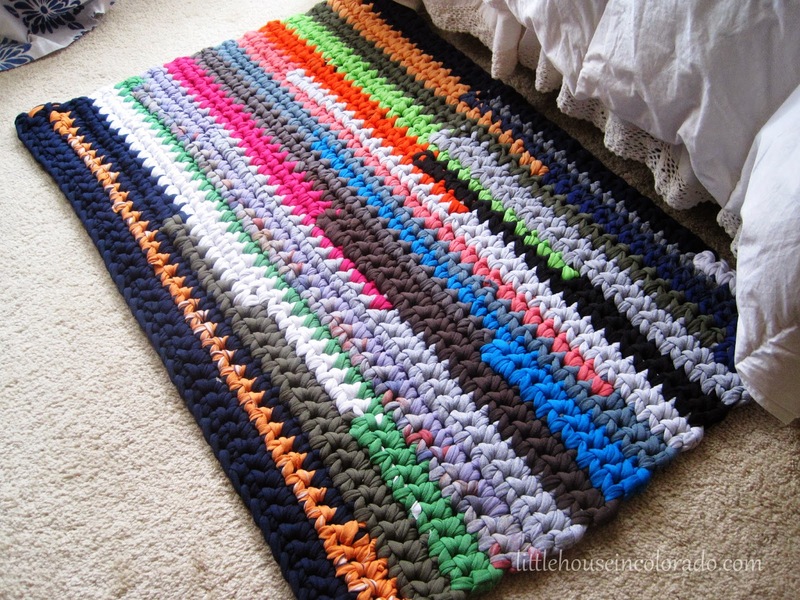 I had intended to make a runner to replace my kitchen rug but I only had enough yarn to make a smaller bathmat sized rug. It worked up in a couple of short afternoons. I'll have to start collecting more T-shirts now. A lot more. 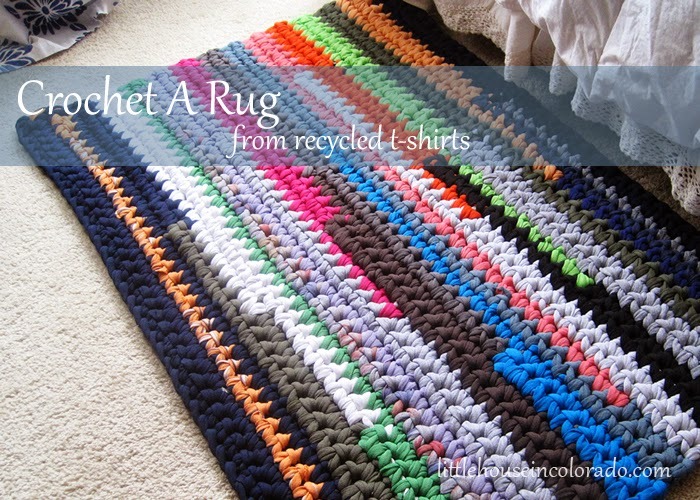 It took 27 T-shirts (25 men's XL and 2 boys Medium) to make this rug. It's 41 stitches wide and 29 rows high. It measures 37" x 24". 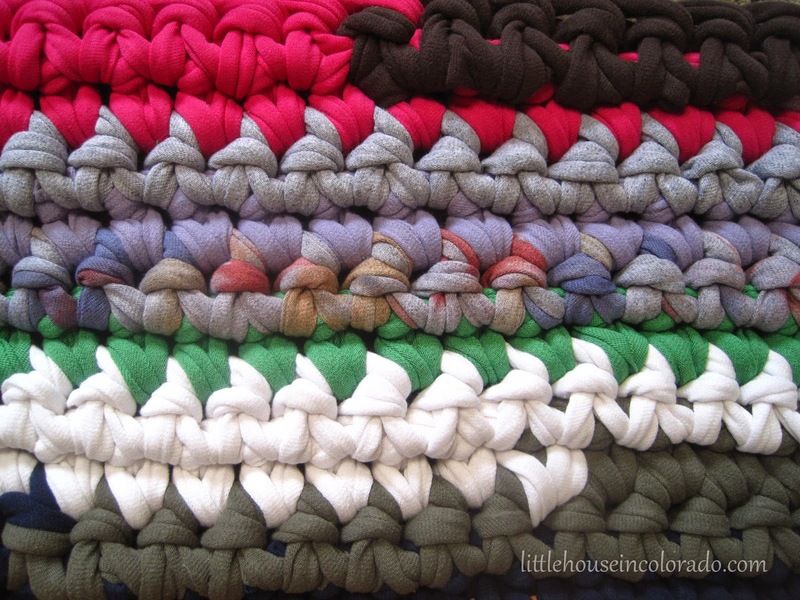 Yarn: Hand cut T-shirt yarn* - there's a good tutorial at Mollie Makes on how to make your own t-shirt yarn. Repeat until your rug is the desired length. 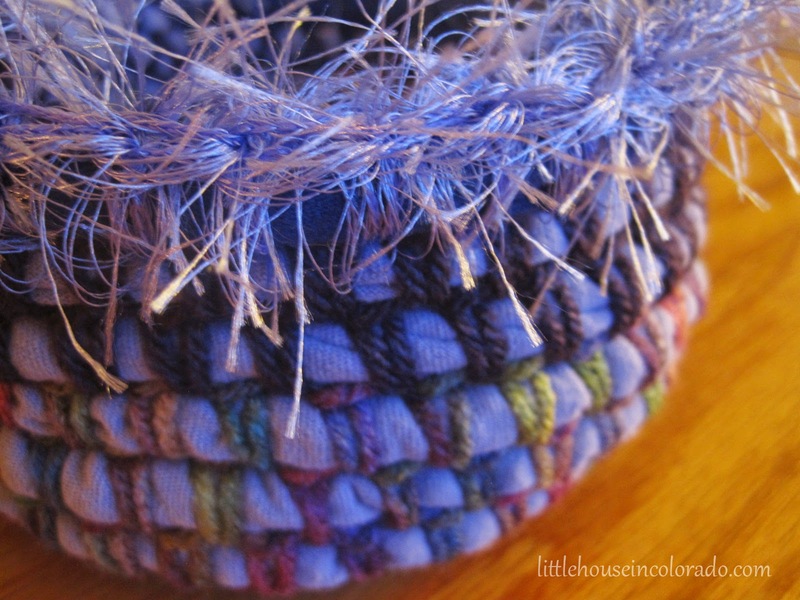 Cut yarn leaving a long tail. Weave in. *Note: The width of your t-shirt yarn strips and the weight of your t-shirt material determine how thick your yarn will be. My yarn strips are about an inch wide. The t-shirt material/weight varies. We harvested our first vegetable of the season this week, and who would have thought it would be a zucchini? 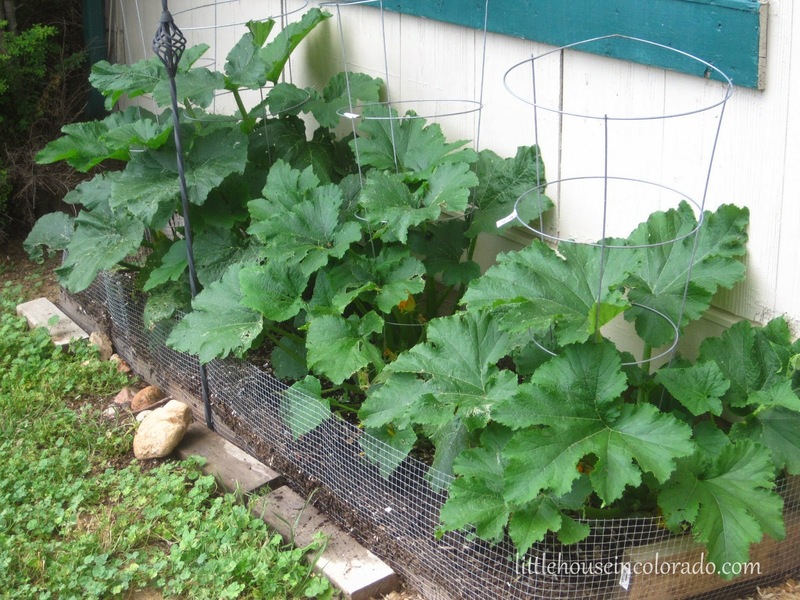 I have at least 2 more zucchinis that should be ready for picking within a couple days. The plants all seem to have bounced back from Turtly's trampling a couple weeks ago. It's almost astonishing to see how much everything has matured in just those two weeks! 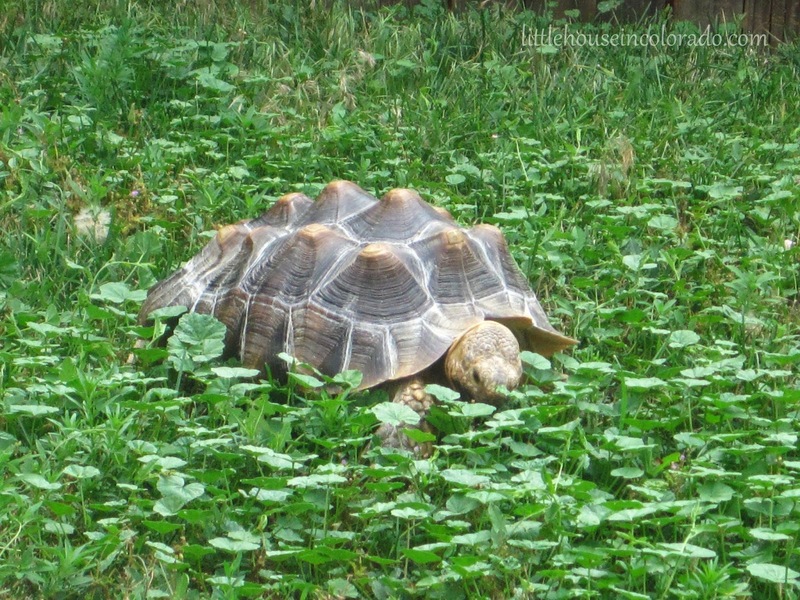 At least the latest batch of precipitation has resulted in more weeds in the yard for Turtly to munch. Perhaps it will keep him from trying to tear down the garden barriers. I was also able to pick a jalapeno for some homemade Pico de gallo on Sunday as well as several bunches of cilantro, basil and oregano which are drying outside. 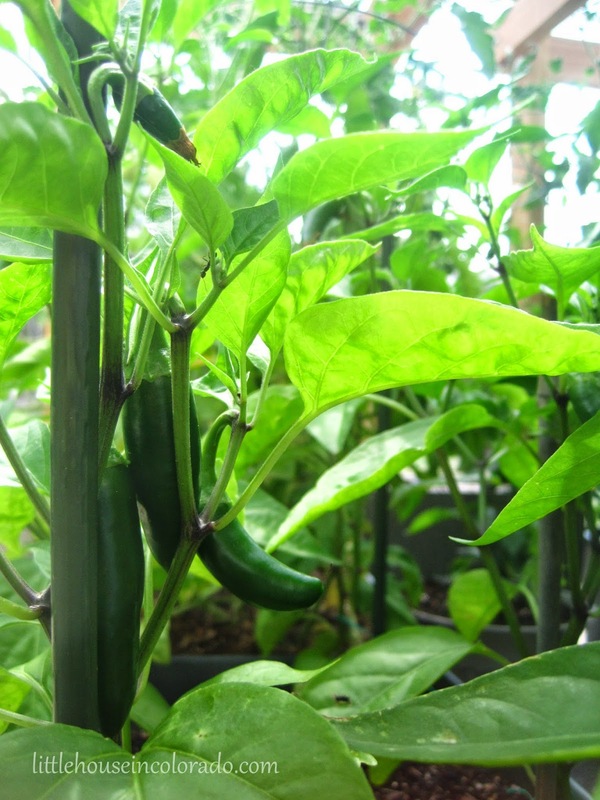 The jalapeno plants are more covered with peppers now than blossoms. We may have to pick a bunch of smallish peppers in order to get more blooms for future peppers. Usually, I'd have piles of beans by now but they have been very slow to do anything this year. At least they have begun to show some progress in the last several days. 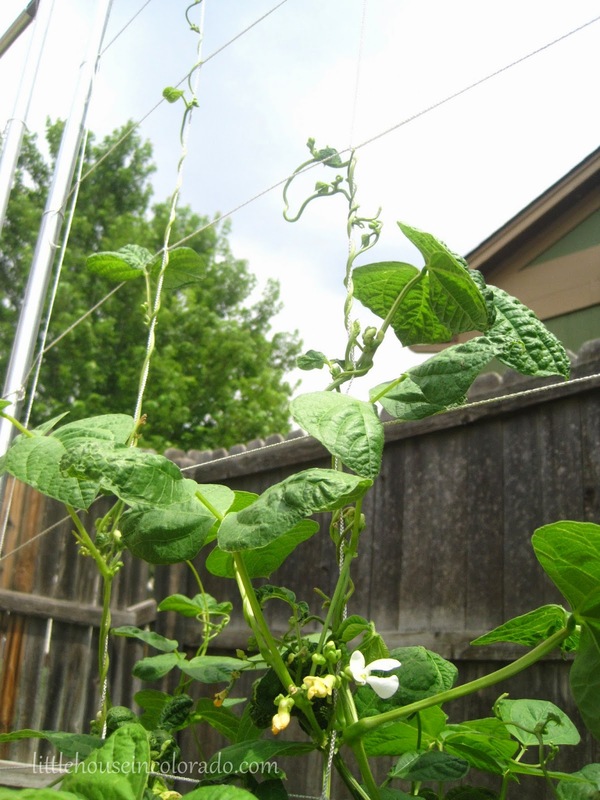 I'm so happy to finally see some blooms on the bean plants, too! 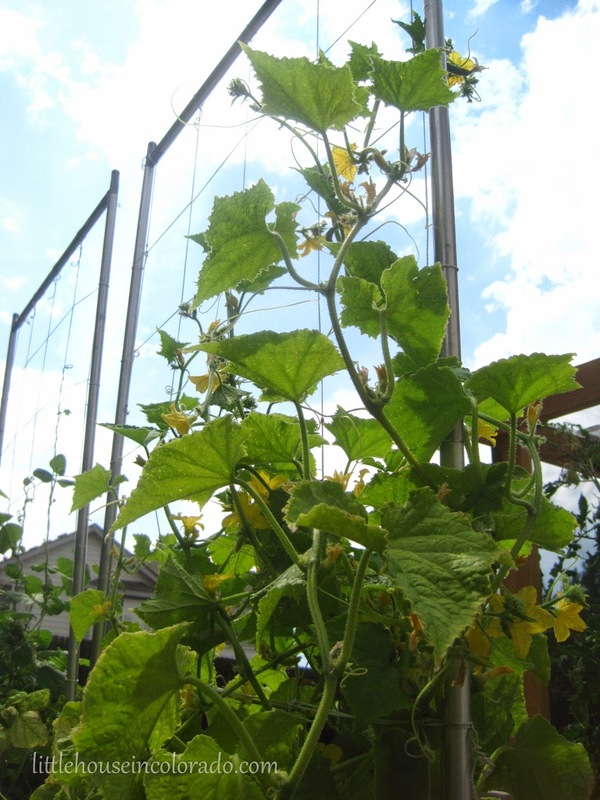 The cucumbers continue producing flowers and fruit (though we haven't been able to harvest anything yet) and the vines keep growing taller. 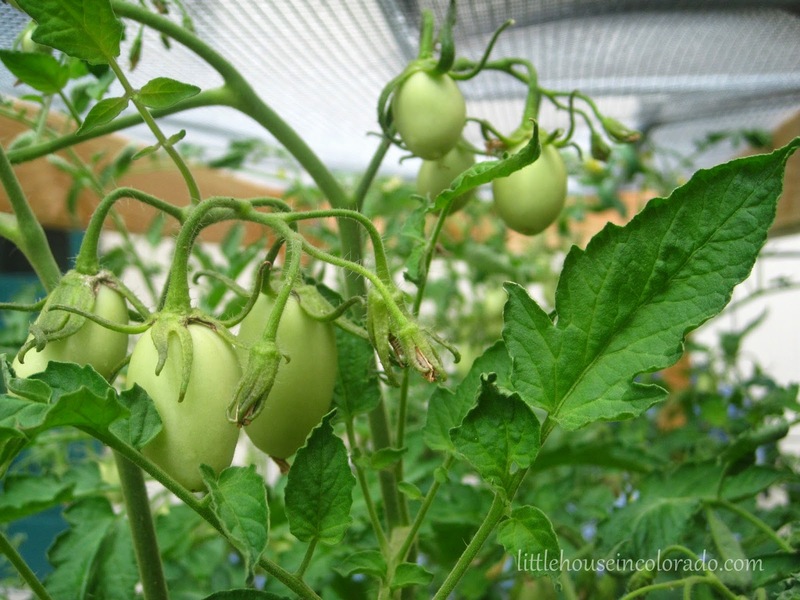 The Roma tomatoes have long since reached the tops of the hail guards and I have plenty of green tomatoes taunting me. 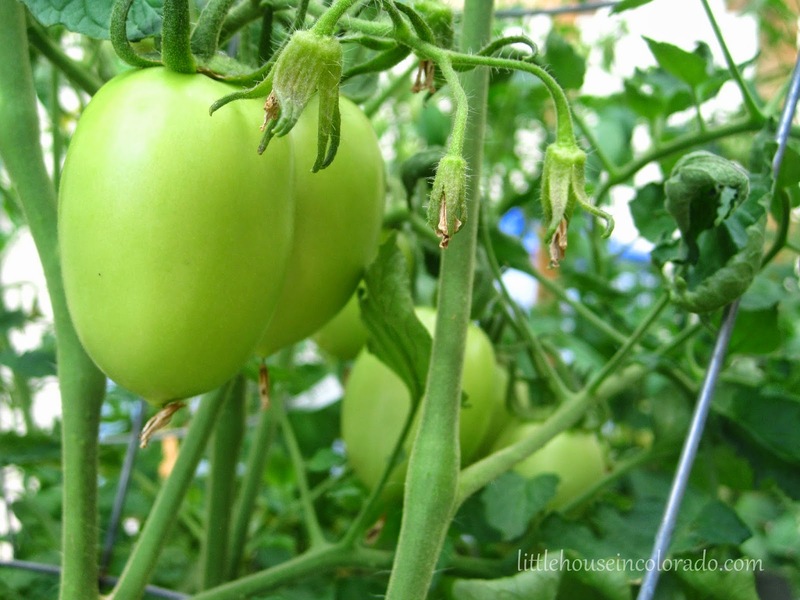 I can't wait for them to ripen! I could do without the excessive heat (near triple digits every day now) but I sure do love gardening season! 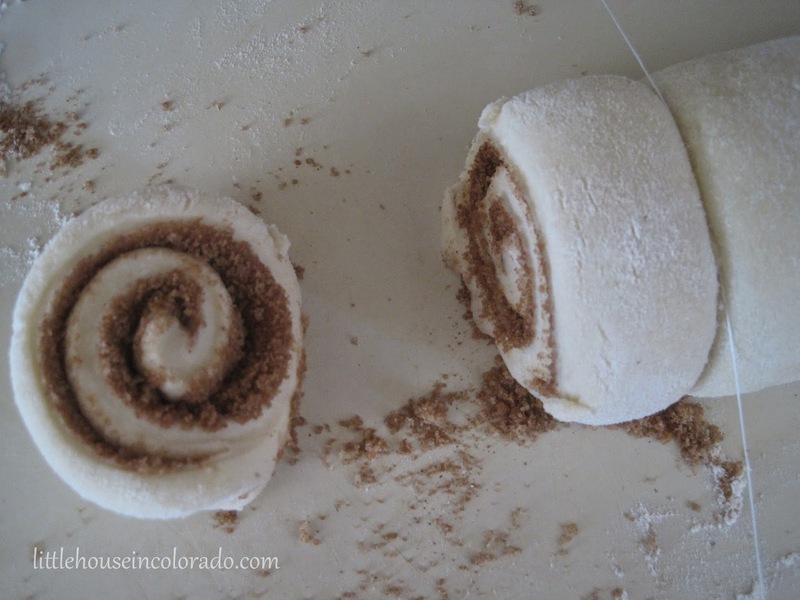 I had never made cinnamon rolls from scratch before. They always seemed to take too much work. 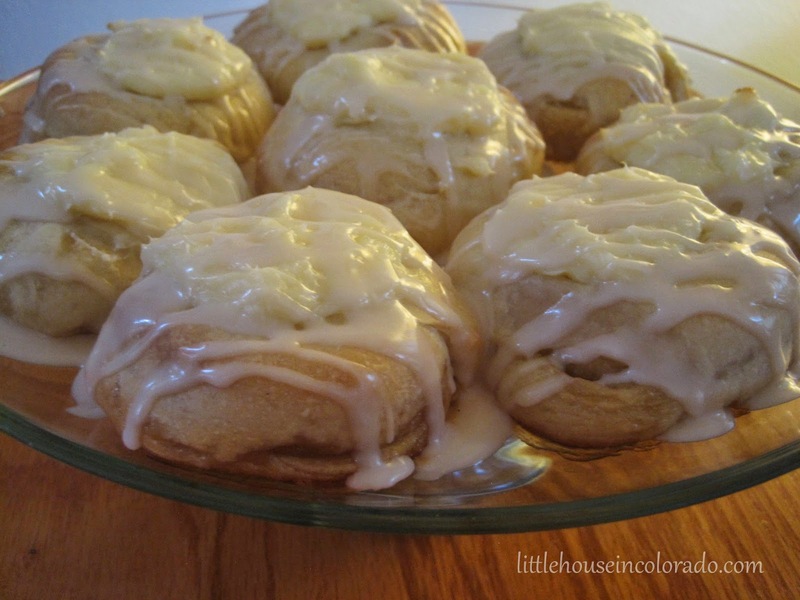 Previously, if I wanted cinnamon rolls, I bought a can of Grands Cinnamon Rolls, popped it open and baked. 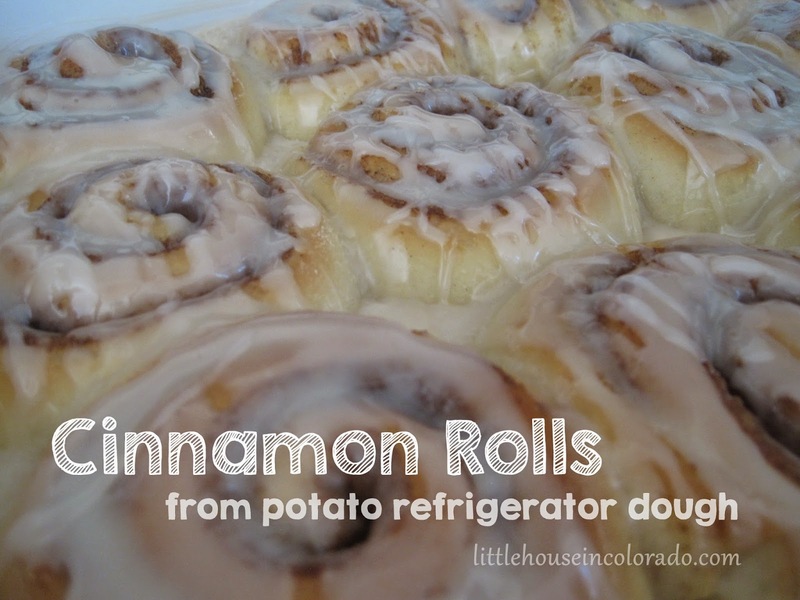 But lately, I have been trying to make more of our foods from scratch (and frankly, a can of cinnamon rolls from the store just doesn't make it into our food budget...ever). 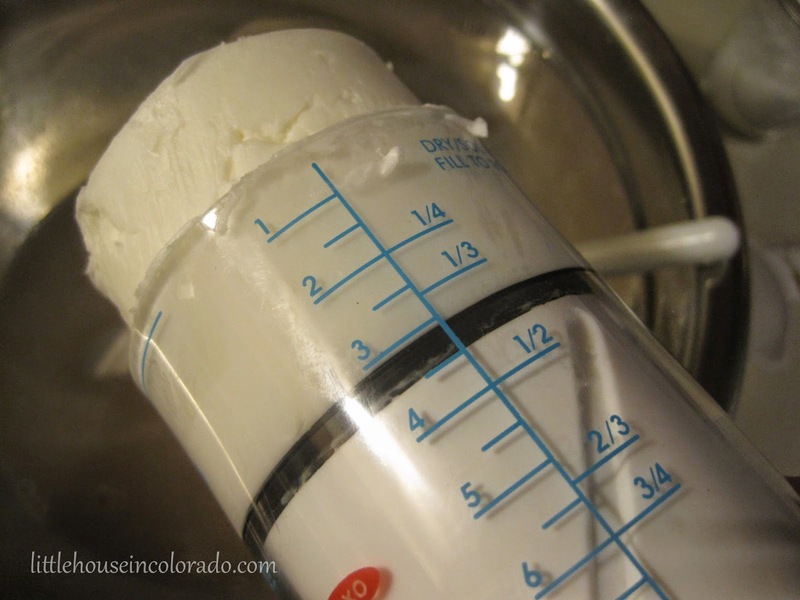 Maybe that's why I sat up and took notice when I was re-reading The Tightwad Gazette III book and came across the recipe for Potato Refrigerator Dough. 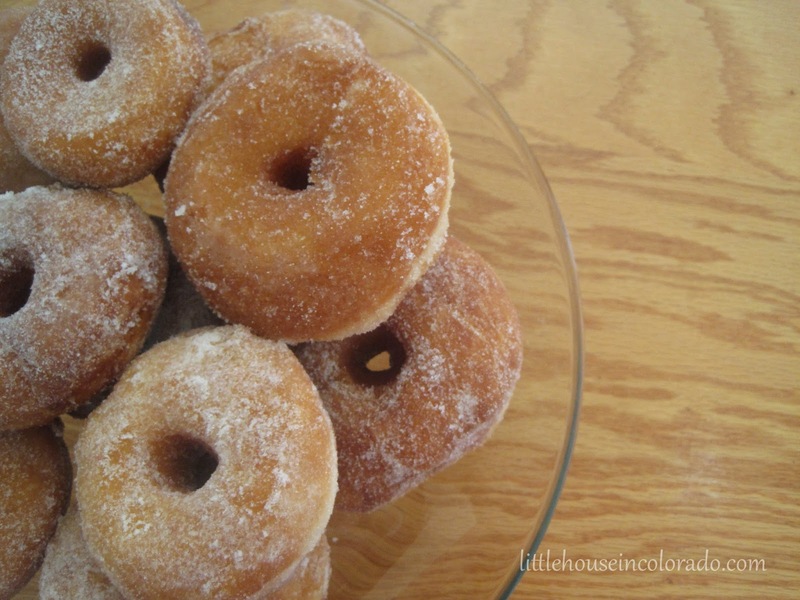 The author of the book made doughnuts with the dough...and cloverleaf dinner rolls...and breadsticks...and CINNAMON ROLLS! 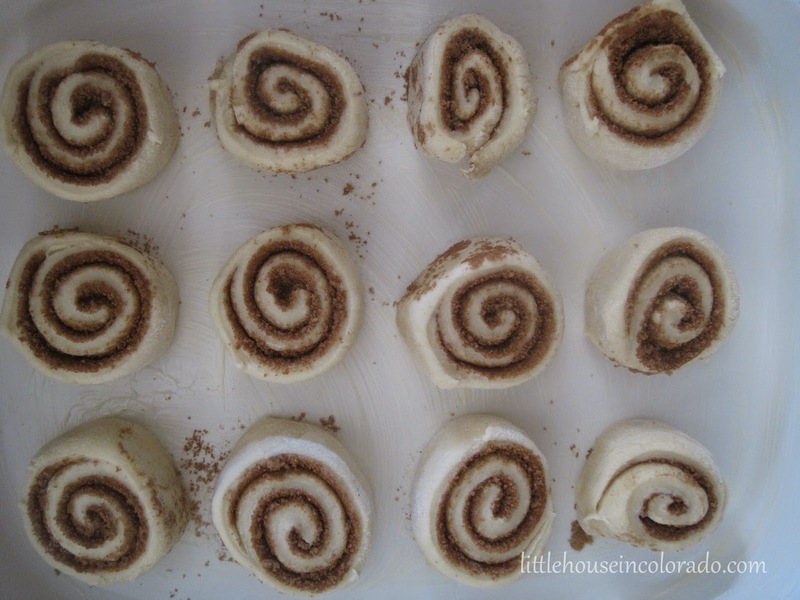 To make a batch of cinnamon rolls so quickly...that would be wonderful! 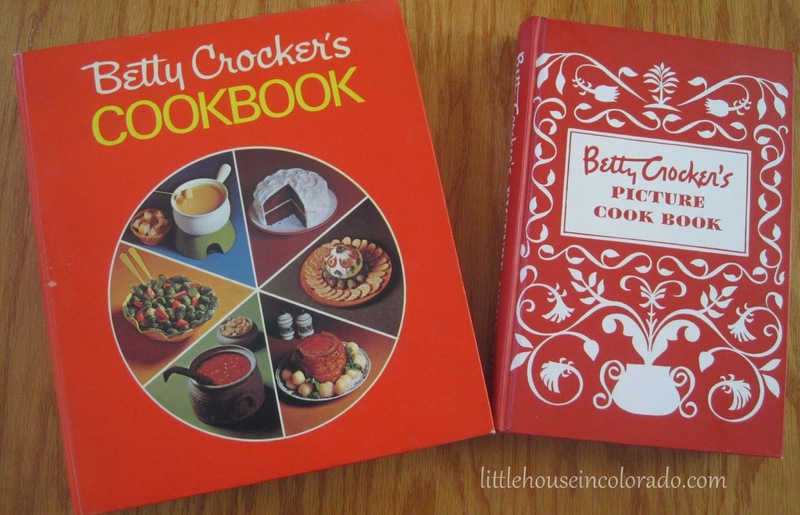 The cinnamon roll recipe wasn't provided in the book...nor was it provided on the Betty Crocker website or in my own Betty Crocker cookbooks (where I found the cloverleaf roll instructions right next to the recipe for Potato Refrigerator Dough). 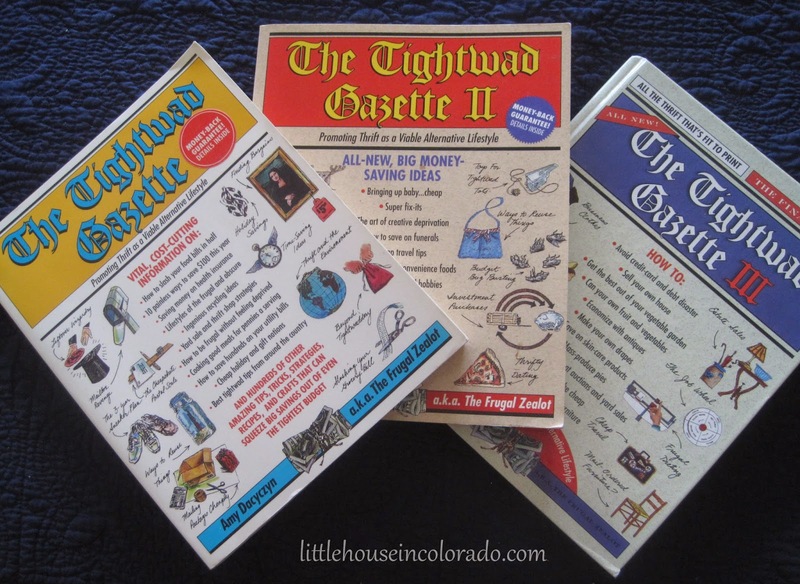 So I searched online and found three different versions ( from Shalom Y'all, Take A Megabite, and cdKitchen). 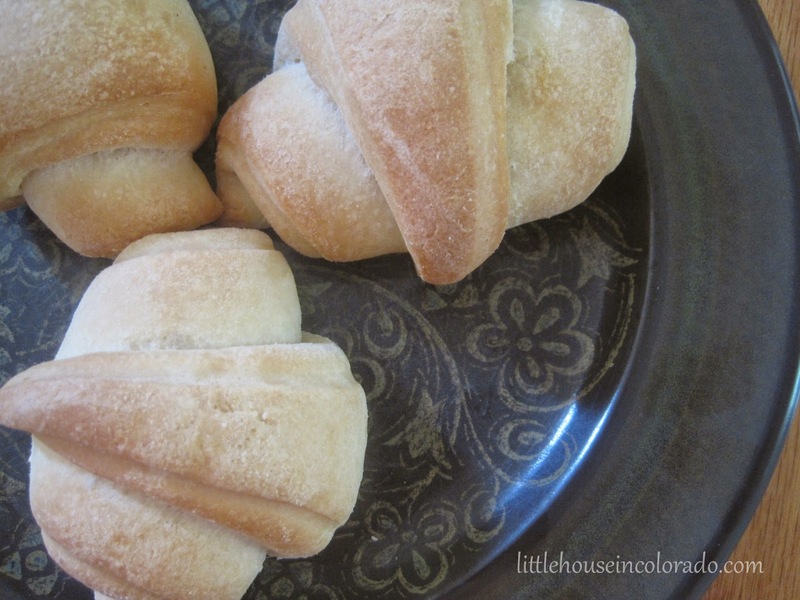 I decided to use a little of all three variations to make my rolls. 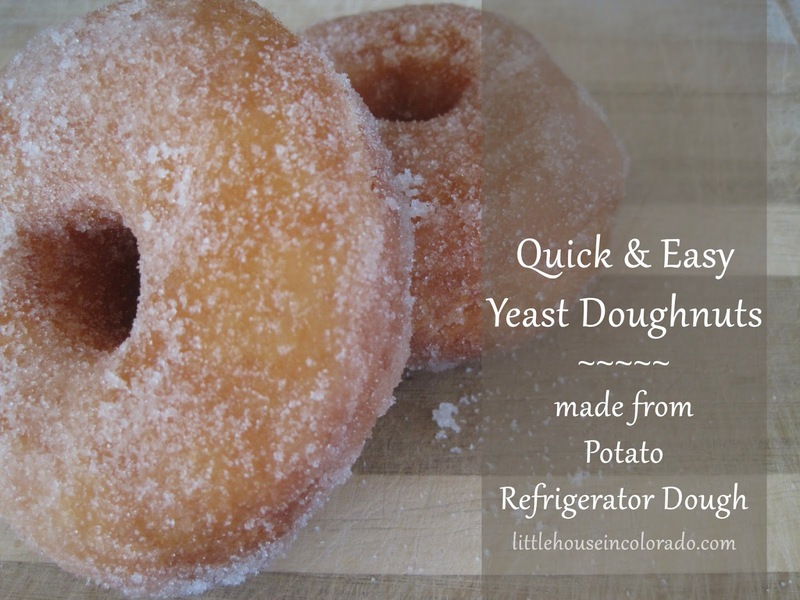 That very evening I made a single batch of Potato Refrigerator Dough. It would need to sit in the fridge for at least 8 hours. 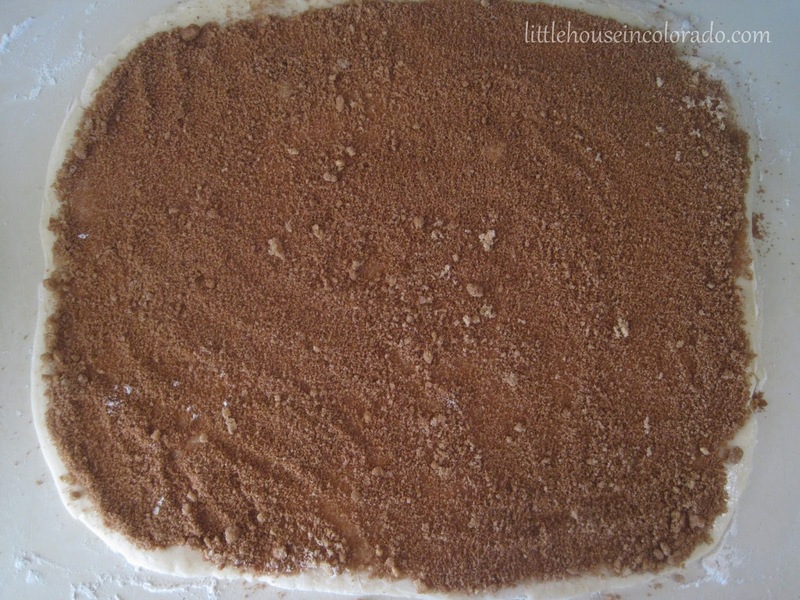 The next morning, I pulled out a 1/3 portion of the dough and commenced my cinnamon roll making. 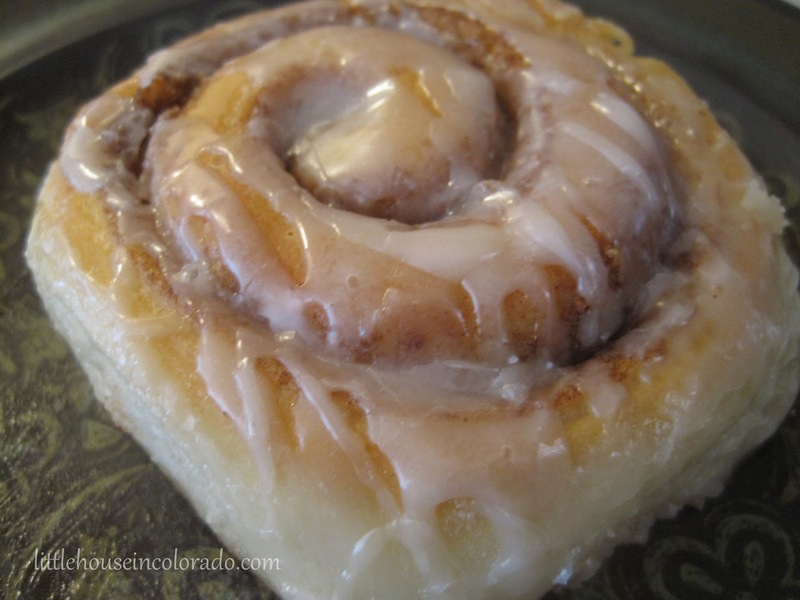 In 15 minutes, I had the cinnamon rolls cut and rising in a pan. All I had left to do was to bake them. 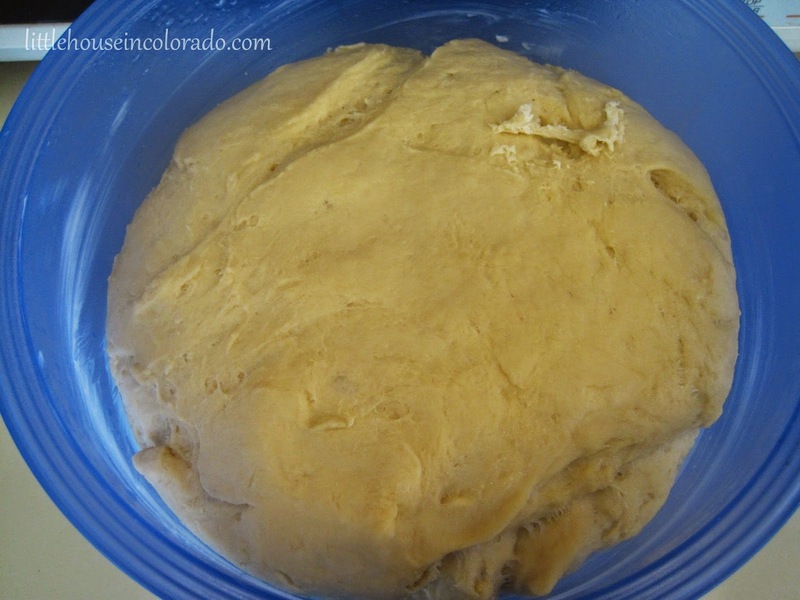 - Spread 3 TBS softened butter on the surface of the dough. - Mark off 1" sections and cut into 12 slices. It is easiest to do this with dental floss. 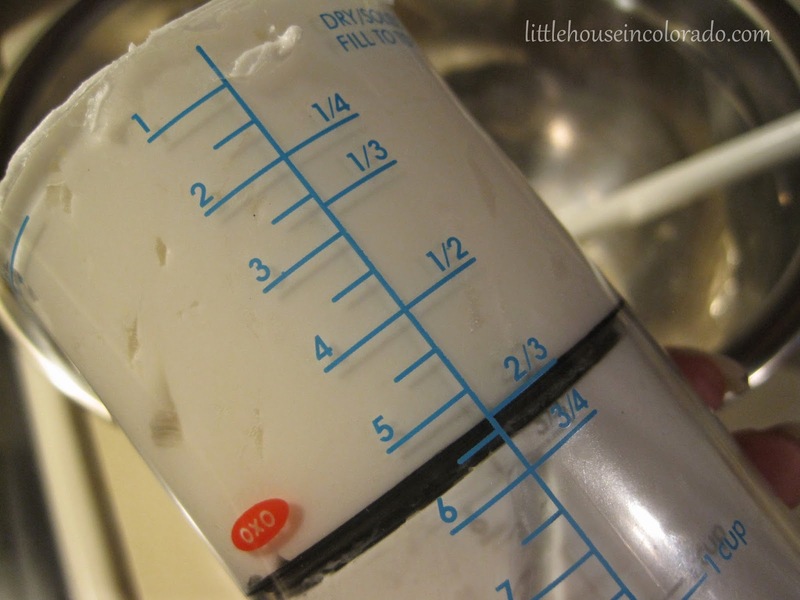 A knife tends to squish the roll down. 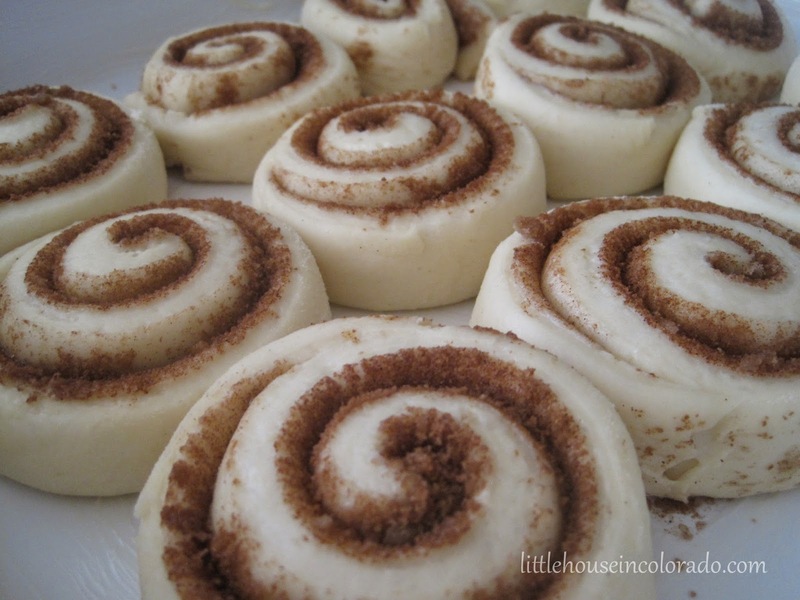 Cinnamon Rolls after rising for 90 minutes in an oven with only the light bulb on. 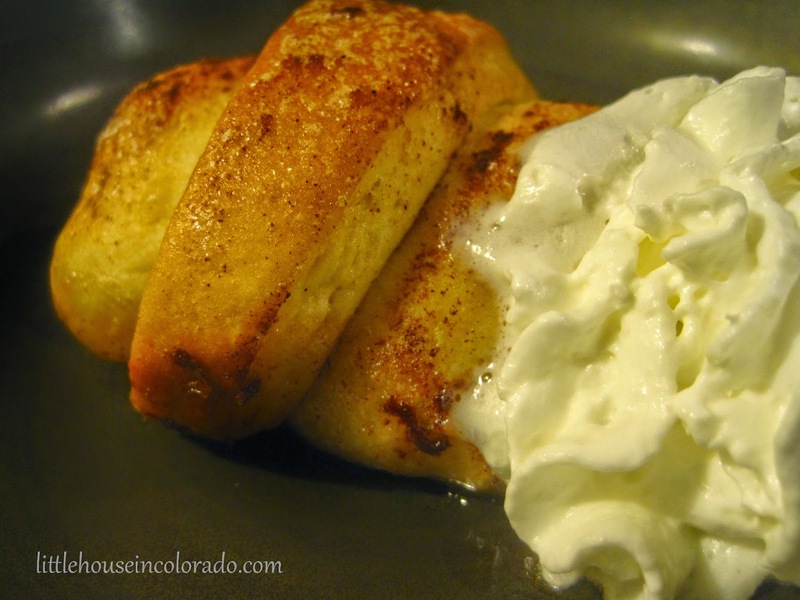 - Remove from the oven and drizzle with a glaze (2 cups sifted powdered sugar, 2 tsp vanilla and 3 TBS milk). I couldn't believe how easy it was! 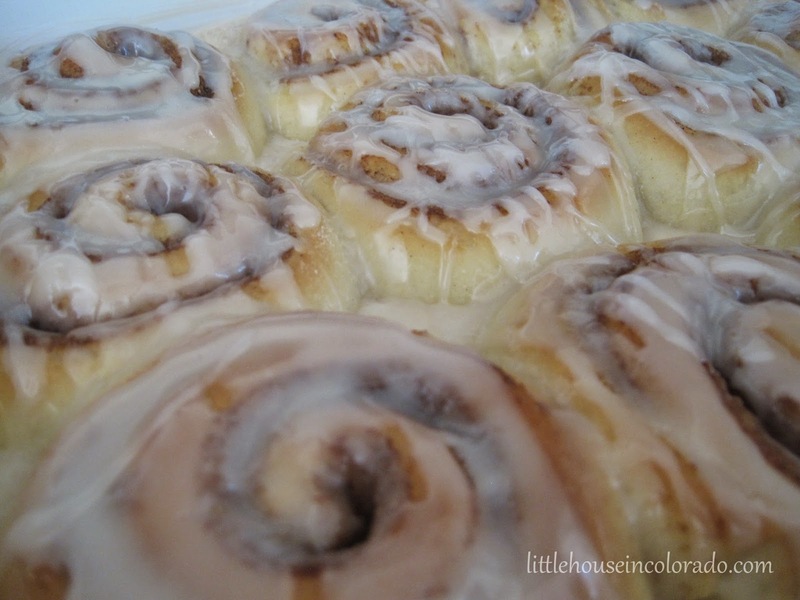 The cinnamon rolls smelled fantastic while they were baking (The Boy commented that it smelled "like a hotel breakfast" in the house). 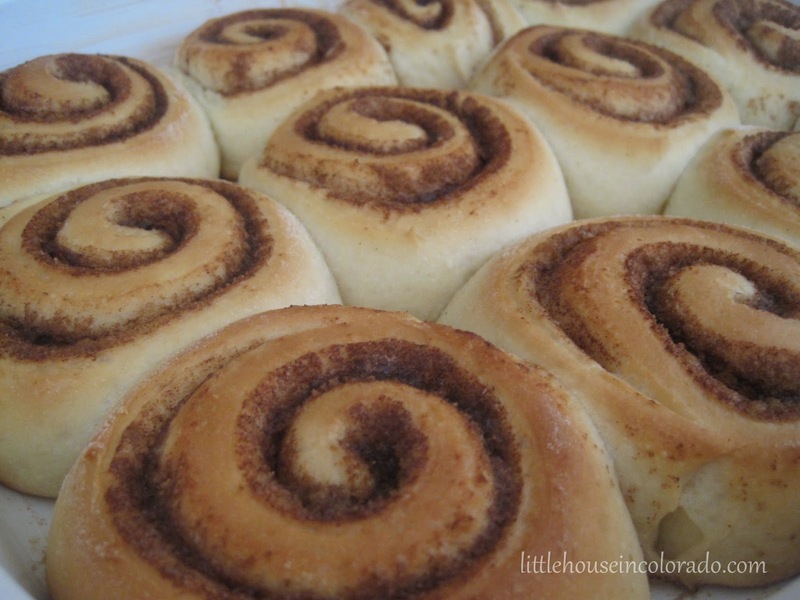 By the time the rolls came out of the oven and were iced, I was ready to dig in. They were SO. GOOD. I unashamedly ate three of them.